CARACAS - Venezuela's Foreign Minister Delcy Rodriguez has criticised as "meddling" a joint statement by 11 Latin American countries calling on Venezuela's government to "guarantee the right to peaceful protest". In their joint statement, the governments of Argentina, Brazil, Chile, Colombia, Costa Rica, Guatemala, Honduras, Mexico, Paraguay, Peru and Uruguay rejected the violence, which has led to the deaths of six people during the recent demonstrations. There has been a series of anti-government protests in the capital, Caracas, and other major cities, as well as marches by government supporters. The opposition is planning another mass protest for Wednesday and the government has called on its supporters to hold rival marches. The Latin American countries also called on the Venezuela government to quickly set dates for elections to be held "to solve the grave crisis which Venezuela is experiencing and which worries the region". 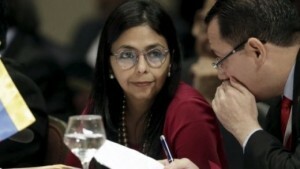 Rodriguez described the statement as "rude interference" and that "these governments misuse international law to back interventionism in Venezuela to attempt to govern the country from abroad". On Tuesday, the secretary general of the Organization of American States (OAS), Luis Almagro, called for protection of the right of the Venezuelan people to demand democracy and liberties and emphasized that this right must be recognized by everyone and the government should not be an obstacle. “The recent actions of the regime to hand out weapons to civilians and urge them toward confrontation are a murderous repressive action that incites violence,” he said. “We must all condemn this kind of actions and the government must absolutely reverse this position that only incites conflict and confrontation. We ask that the right of the people to peaceful protest be respected,” he added.